The United Kingdom is full of historic ruins. From Iron Age to Industrial Revolution, dramatic or romantic, they conjure up images of a bygone past. Every county has its historic ruins in desperate need of restoration. 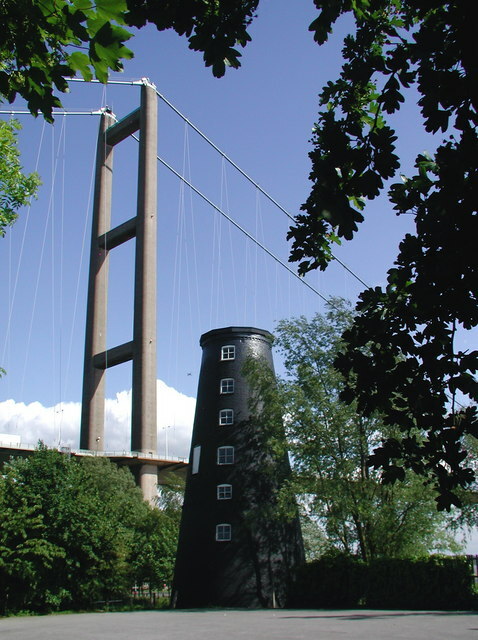 Hessle Whiting Mill in the shadow of the Humber Bridge is a local icon along the river. Now, friends of the monument are looking forward to a restoration project several years in the making. At the beginning of March, the site won a successful Heritage Lottery Fund grant. Some £724k of passed into the hands of the restoration team, money that will now go to good use. Constructed in 1806, Hessle Whiting Mill quickly became a local icon due to its five sails rather than the typical four. Its function was to crush not wheat as many were, but chalk used in construction, cosmetics, and in paint. This is where the “Whiting” name originates. The sails are gone, but the main structure remains. it is this beautiful black tower in the shadow of the bridge that will be preserved for the future. Historians believe the black colouring is a recent addition. As it was near a chalk pit and crushed chalk, it likely had a white outer shell. The integrity of the structure is to be improved along with a new floor of the building. New murals and artwork are also planned to draw visitors from across Yorkshire. The total cost of restoration is close to £950,000. The Heritage Lottery fund contributed £724k while the local council will foot the remaining £200k. In the long-term and as with all such projects, the mill should become self-sustaining with increased tourism. Its position beneath the bridge should improve visitor numbers.